Nick Lyon, Michigan Department of Health and Human Services director, listens to testimony in a March 26 file photo. 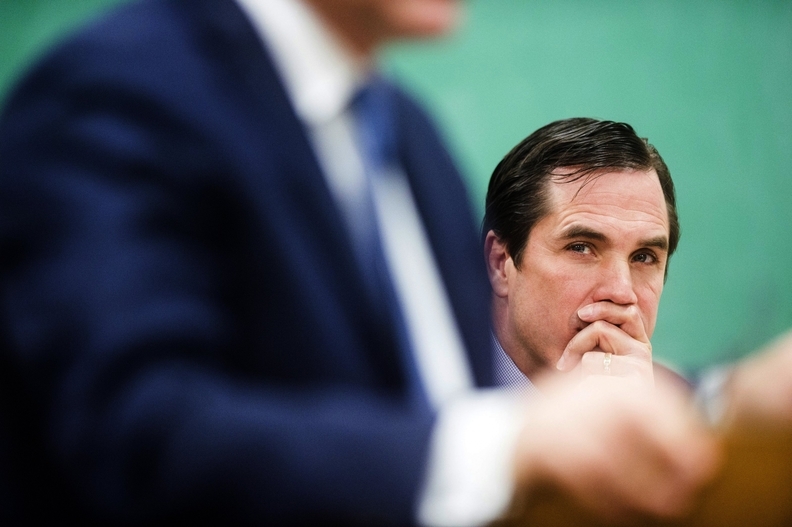 Attorney General Bill Schuette's special prosecutor in the Flint water crisis has added an extra involuntary manslaughter charge against Michigan Department of Health and Human Services Director Nick Lyon and tacked on a new misdemeanor charge. Special prosecutor Todd Flood on Tuesday amended the criminal charges against the state health chief, adding a second involuntary manslaughter charge for the 2015 death of 83-year-old John Snyder of Flint. Flood had previously charged Lyon for being criminally responsible for the December 2015 death of 85-year-old Robert Skidmore of Genesee Township, who contracted Legionnaires' disease in June 2015 after being hospitalized at McLaren Hospital. During Lyon's 10-month-long preliminary exam, the state prosecutor called witnesses to testify about Snyder's death and Lyon's defense attorneys contested the facts surrounding the deaths of both men and pre-existing medical conditions they had. "There's no medical evidence that either of them died because of Legionnaires' disease," said John Bursch, a Grand Rapids attorney who is part of Lyon's taxpayer-funded criminal defense team. "There's no action or inaction of Mr. Lyon that caused them to be ill."
The amended charges against Lyon, which includes a new misdemeanor charge of willful neglect of duty in office, were filed before the Fourth of July holiday as required by the Genesee County judge who is expected to decide by July 25 whether Lyon should stand trial for the Flint water-related deaths. Closing arguments in the preliminary examination of Lyon are scheduled for Wednesday in Genesee County District Court in Flint. Flood's case hinges on convincing Judge David Goggins that the state health chief's failure to alert the general public about the Legionnaires' disease outbreak led to the deaths of the two elderly men. On Thursday, Flood also filed amended charges against the state's chief medical officer, Dr. Eden Wells, scaling back the scope of his original allegations that she tried to cover up the Legionnaires' outbreak. Flood's amended complaint of a charge of involuntary manslaughter against Wells for Snyder's death also clears up an impossible sequence of events that was contained in his original Oct. 9, 2017 complaint. That document alleged Wells' instruction to the county health department in December 2015 to withhold information from the public about the Legionnaires' outbreak caused Snyder's death on June 30, 2015. A charge of obstruction of justice against Wells also drops Flood's original allegations that she threatened to withhold funding from a team of researchers at Wayne State University who were studying the Legionnaires' outbreak. Wells' preliminary examination has spanned 17 days in court since last October. Closing arguments in preliminary exam begin Aug. 6. The amended charges filed Tuesday against Lyon are not considered new, as Flood informed his attorneys of them last year, Schuette spokeswoman Andrea Bitely said Friday. The criminal prosecutions of Lyon, Wells and other officials at the state health department have generated nearly $5.3 million in legal bills as of June 22, according the department's most recent data. Gov. Rick Snyder has stood by Lyon and Wells as they've faced criminal charges and did not suspend them or other state employees in the health and environmental quality departments who have faced charges from Schuette for their roles in Flint's lead-tainted water crisis. Lyon's legal bills from Willey & Chamberlain in Grand Rapids topped $1.35 million as of June 22, while Wells' private attorneys at the Ann Arbor law firm Pear Sperling Eggan & Daniels have billed the state about $555,000. Bursch's Bursch Law has been paid about $50,000 to date, state records show. "Flint water prosecutor amends charges against Lyon, Wells" originally appeared in "Crain's Detroit Business."